I’ve started to digitize some old VHS tapes with family stuff on it. Took my old VHS machine from the attic, blew of some dust and connected it with my Panasonic dmr-eh68 Hardisk recorder with a svhs cable. I put the Harddisk recorder in XP mode (highest quality) and started recording tapes in blocks from less than 1 hour to the hard drive. And copied these movies onto a dvd’s. This VOB had some errors in the heading, with a simple ffmpeg command this was quickly resolved. Just copy every thing into an mkv. Wy a mkv container. This is because of the wrong (or better missing) aspect-ratio in the VOB file. All that aspect SAR and DAR are completely wrong. 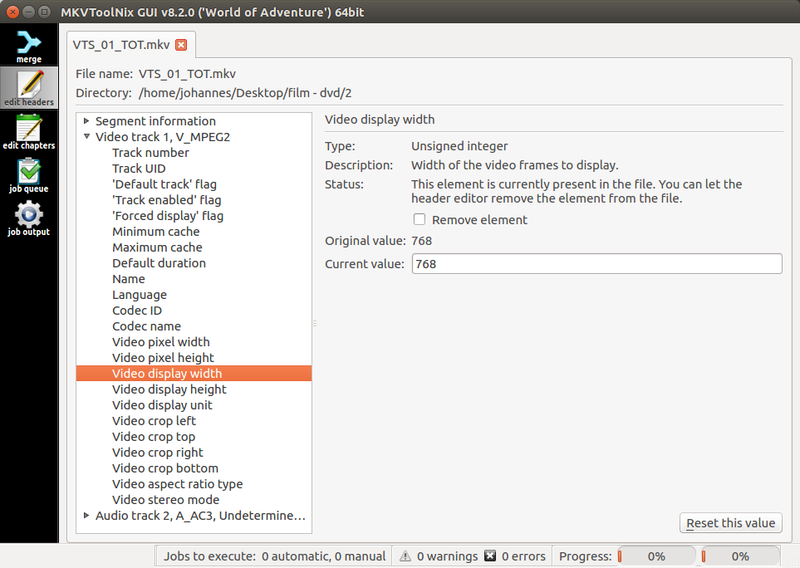 Changing this values in an mpeg container is quite difficult. But with the tool mkvtoolnix it is quite easy to do. That’s why I used an mkv container. Now how to change this in mkvtoolnix. Start mkvtoolnix and navigate to the edit headers tab (on the left side). From the menu save the file. Headers are now (for me) correct for editting in Kdenlive.